Whenever I'm asked to make cupcakes for a crowd, I turn to this recipe. The cakes are always moist and tender, and if you go the extra mile and fill them with strawberry jam, they taste like they're from a fancy bakery. The recipe yields about 5 dozen cupcakes, and in my experience, leftovers are extremely rare. 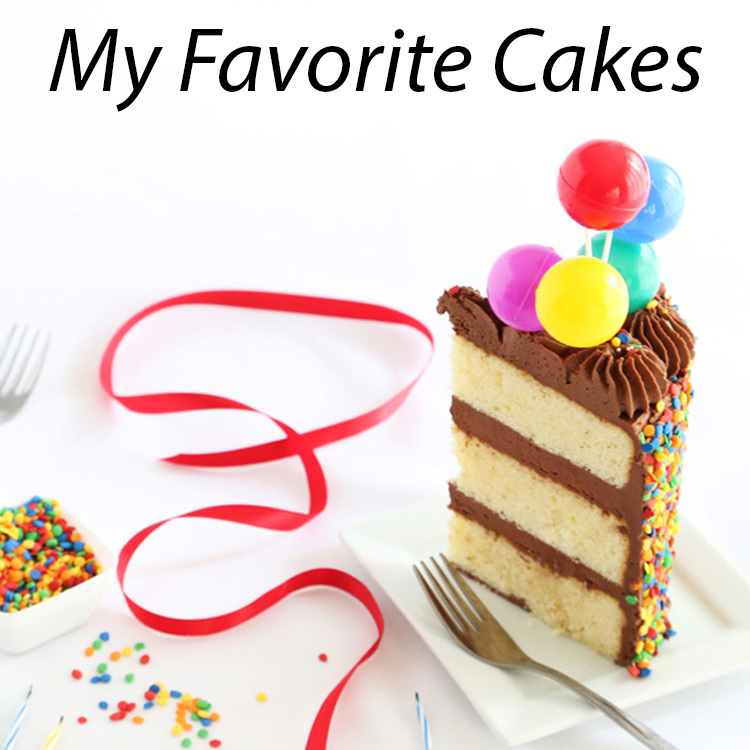 If you've been reading this blog for a while, then you know I prefer scratch-made cakes to box cake mixes. This cake recipe uses a little from both worlds. It uses scratch elements such as flour, sugar and eggs, but it also uses strawberry cake mix as an ingredient. If you're a purist, then this may not be your cupcake. If you're someone that doesn't mind the occasional box mix, and you're looking for a strawberry cupcake recipe that is consistently good, then this may be for you. 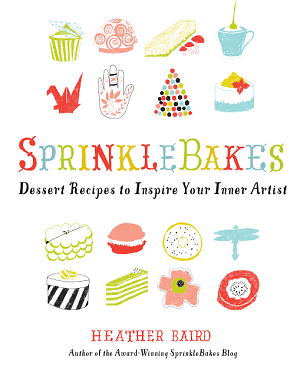 I thought it might be helpful to share some of my favorite large batch cupcake-making tools. Nothing too fancy here - just a few things that make my life easier when I'm a one-woman cupcake factory. An ice cream scoop is extremely helpful for doling out even portions of batter. I use this one , which holds about 4 tablespoons of batter and fills the paper liners about 2/3 full. All the cupcakes come out of the oven looking like clones, which is the whole point. 5 dozen uniformly crowned cupcakes is a beautiful sight to behold. I am never, ever without white paper cupcake liners (I know - you may be thinking boor-ring!). They come in a stack of 500 and they're inexpensive. I've recently taken to baking all my cupcakes in them, and if they need a little more pizazz after baking and frosting, then I'll just pop the cupcake in a second colorful or patterned liner. I do this for almost every batch of cupcakes I make for large parties and gatherings. Good flavor is of paramount importance, but don't underestimate the draw of a cupcake with eye-appeal. 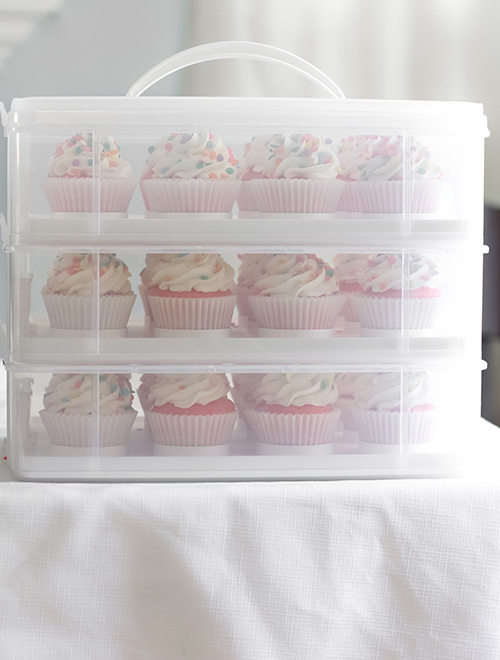 Another essential that I just cannot live without, is my 3 dozen cupcake carrier . Actually, I have two. I use them all the time to keep cupcakes fresh and moist. I once saved a batch of overbaked cupcakes just by putting them in this container overnight. It really seals in the moisture and keeps all kinds of treats at peak freshness. The design of this product is so well thought-out I can't help but sing its praises. The inserts lift out and snap into raised cupcake trays for display or you can flip the them upside down and store three 1/4 sheet cakes or 8 dozen cookies- whatever you like. You can snap additional trays on the bottom as needed. I've used these to tote treats to book signings, bake sales, festivals, parties, church functions - you name it, it's been there! It is my preference to crown a cupcake with an extra-large frosting swirl, but that can mean several messy refills if you're using an average-sized pastry bag. I use this 23-inch piping bag made by Ateco. It holds a ton of frosting and keeps refills to a minimum. I also like the grippy texture - no slipping! If I had to choose only one piping tip to use on cupcakes for the rest of my days as a baker it would be this one . No coupler is required, just drop the tip in the bag and press it down into the hole at the end of the piping bag. One last note on these strawberry cups -choosing quality strawberry filling is important. If you don't have homemade strawberry jam, choose jams that have limited ingredients. My favorites contain only the following: strawberries, sugar, fruit pectin, citric acid. Some of these more natural strawberry jams may not have vivid red color, so a drop of liquid red food color can be added to make it look more berry-tinted. Also, if the jam has chunky pieces of strawberries, consider whizzing it in the food processor to make a smoother filling. This recipe was given to me by a caterer friend, though you can probably find variations of it on more than a dozen websites throughout the blogosphere. She notes to avoid cake mixes with "pudding in the mix". Preheat oven to 350°F (or 325° for dark pans). Line the wells of one or more cupcake tins with paper liners. Whisk together the first 4 ingredients in a large mixing bowl. In a separate bowl, stir together the sour cream, water, eggs and extract. Add the wet ingredients to the dry ingredients and beat with an electric mixer on low speed. Scrape the bowl down and mix again. 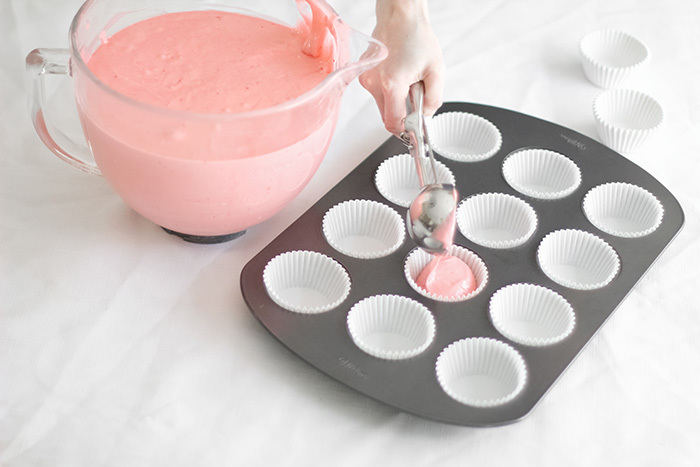 Divide the batter between cupcake liners filling them 2/3 full. Bake for 15 to 17 minutes, or until the cakes spring back when pressed in the centers. Transfer the cakes to a wire rack to cool completely. When the cakes are cool, cut a divot in the tops of the cakes using a serrated knife. Discard the cut-out, or save it for an ice cream sundae topping. 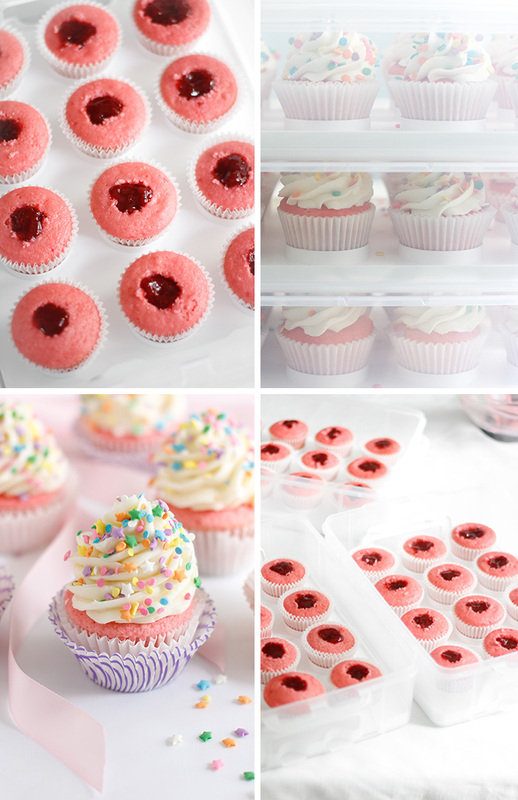 Fill each cooled cupcake with strawberry jam. In a stand mixer fitted with the whisk attachment, whip the butter until creamy. Add the confectioners’ sugar. Begin on low speed until just combined, and then increase to high and beat for 3 to 5 minutes ,or until the frosting lightens in color and texture. Add vanilla and beat again for another minute. If you find the buttercream is too stiff, you may add milk or heavy cream 1 tablespoon at a time until the mixture is spreading consistency. Transfer the frosting to a large piping bag fitted with a large closed star decorator piping tip. Pipe swirls of frosting onto the tops of the filled cupcakes. 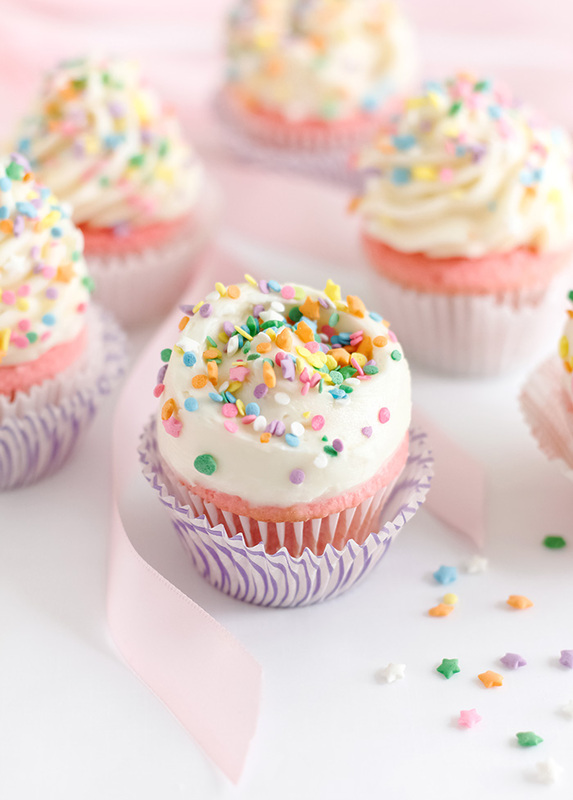 Immediately decorate frosted cupcakes with confetti sprinkles, if using. Store cupcakes in a container that seals air-tight. 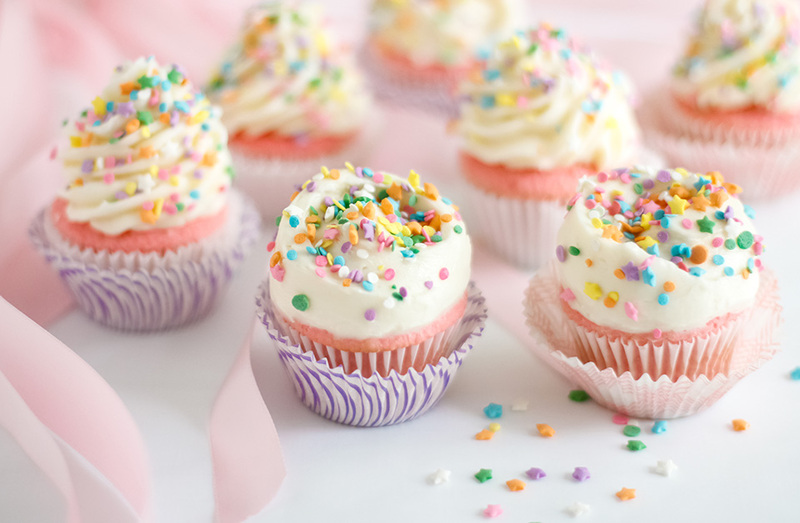 If preparing cupcakes a day ahead of time, store them in the refrigerator in an air-tight container. Allow them to come to room temperature before serving. These are beautiful! Love all the tips too! Thank you! I just smoothed on some frosting with a small offset spatula and made sure the middle had an impression to hold extra confetti sprinkles. Perhaps I should do a video of the technique. I'd love to see a video on that technique! Also, about the the cupcake carrier you use - are the levels high enough to hold cupcakes with a high frosting ratio without disturbing the frosting? These are gorgeous! The carrier accommodates tall frosting - yet another thing I love about it! The picture of the cupcakes in the carrier is a bit deceiving. It almost looks like the frosting is being squished down, but it isn't. I use at least 1/4 cup of frosting on each cake (more like 1/3 cup, really - frosting fan here!) and I never have a problem. 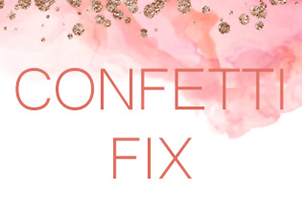 If you have large plastic cupcake toppers for decoration, they may need to be added after the cupcakes are removed. Wow this is a perfect dessert. Your Strawberry Cupcakes recipe looks very delicious and yummy it attracts me. My kids will surely like this very cute recipe, good for healthy eating.I am excited to make this weekend. Can't wait to taste this and I want to share this to my friends. Thanks for sharing your inspiring recipe as free. Nice tip, definitely helpful. Thank you for the response about the frosting in the cupcake carrier! It's now on my wishlist! These are so pretty! Love the addition of the strawberry filling! 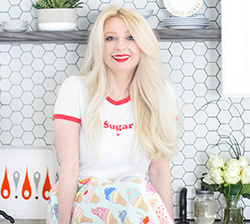 These cupcakes look divine, Heather! Love the strawberry filling in each cupcake. Your photos are stunning too! Which brand strawberry cake mix did u use? Ur cupcakes look amazing and for the filling can I use Bon mama strawberry preserve ?? Hi Anonymous - Duncan Hines. Yes, Bon Maman is an excellent choice! Thanks for asking! Hi, may I substitute the strawberry cake mix with the vanilla cupcake cake mix? I can't find Duncan Hines brand in Australia, is Betty Crocker a good choice? Thank u.
Hi! Yes, this recipe works with all kinds of flavors. Vanilla would work well. I am very familiar with working with Betty Crocker cake mixes, and they all say 'pudding in the mix' on the box, which I was told to avoid in this recipe. However - I recently tried this recipe with Betty Crocker's SuperMoist Lemon cake mix, and it turned out fine. So, I see no reason why you couldn't use a BC strawberry cake mix. Strawberry is a great flavoring for a large batch of cupcakes! They’re perfect for feeding a crowd, too. I like to decorate mine with a cream cheese icing and rainbow sprinkles. Hi! If I did not use the preserve inside - is this still a good strawberry cupcake recipe? Hi, do these freeze well? I've got s big party coming up but I've gotten sick and need to try and spread out the prep as much as I can. So if I make them the week before then freeze them, are they still as good once defrosted? I'd recommend freezing the unfilled, unfrosted cupcakes in hefty zip-top bags. You can make the frosting ahead of time and store it separately in the refrigerator. Bring everything to room temp before assembling. Are these good without the preserves? I am ready to do a Lemon Cake Box one... Some oil maybe? The sour cream makes the cupcakes really moist, so I've never added oil to the recipe. Made these for a birthday and they were delicious!! I've been having a hard time finding a nice strawberry cupcake (scratch) recipe and decided to try yours. Love it!! Really enhances the cake mix! Now to try vanilla...! Hi Heather, I just wanted to ask what happens if you do use the cake mix that says "pudding in the mix"? I'm so glad I found this I'm going to attempt to do these for a charity bake sale wish me luck! Thank you! Will this recipe work if I halved it? 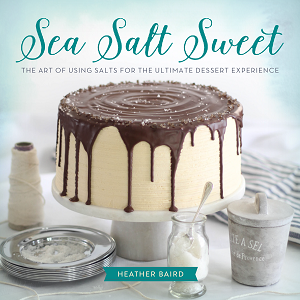 Sea Salt Sweet is Available for Pre-Order!